Cockington Watermill has a gorgeous overshot water wheel. It was formerly known as “Water Mill to Granary, Cockington Lane” – hmmm, catchy! 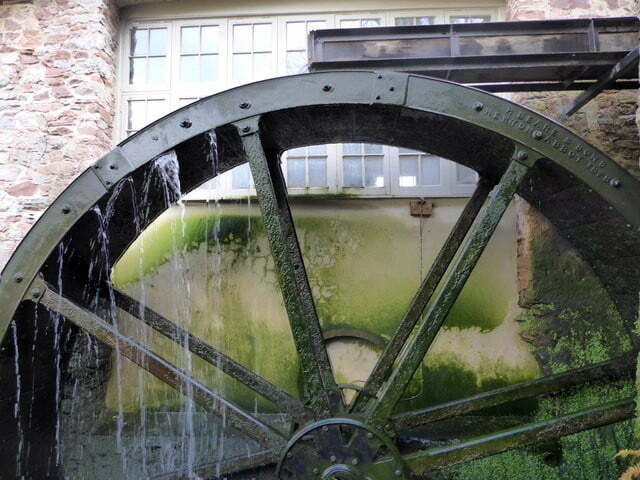 Anyway, the wheel at Cockington Watermill is dated 1878, but is suspected to have older origins. The cast-iron wheel has the founders’ mark; H Beare and Sons, Newton Abbot, 1878. It probably ground corn into flour and is reported to have powered a sawmill too. The mill was considerably restored in the 1900s and what a splendid job it was too. It is now grade II listed and situated in the idyllic grounds of Cockington Country Park. You have the Court, pub and forge nearby, as well as cobbled courtyards and numerous ye olde buildings to enjoy. The wheel still turns and you can enjoy an ice cream or cuppa in the tea room there!